Since the Association of British Theatre Technicians (ABTT) was founded in 1961, the ABTT Theatre Planning Committee has aimed to provide impartial advice with the purpose of improving the design and technical standards of new or refurbished performing arts buildings of any size. 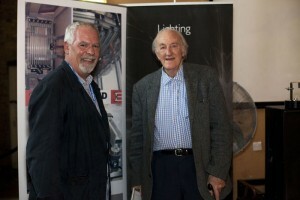 In the ABTT’s fifty-one year history, only three men have chaired the Theatre Planning Committee and at last month’s ABTT Theatre Show, the organisation took the opportunity to formally acknowledge the accomplishments of both the current chairman and his predecessor, Tim Foster and Roderick Ham respectively, who were created Fellows of the ABTT. The ABTT Council, who only bestow this honour upon individuals who have rendered outstanding service to the technical aspects of the art of the theatre, felt it particularly fitting to award Fellowships to these eminent industry figures at the same time, as their endeavours for theatre planning have been so intertwined. Rod Ham went from school to the army in 1943 and after a short course in engineering joined the Royal Engineers. He saw service with the Royal Bombay Sappers & Miners in India and with a field company in Sumatra, before returning to England in 1947. Once demobbed, he began studying architecture at the Architectural Association School and since his interests had always included drama – he had both acted and directed as an amateur – he concentrated on designs for theatre buildings. After qualification and experience as a Clerk of Works, he started his own practice in 1954. In 1961 he was in Italy when the ABTT was formed and joined as soon as he returned. He was made chairman of the Materials Committee and also joined the Architecture Committee (now known as the Theatre Planning Committee), which was chaired by Peter Moro and whom, upon retirement, Ham succeeded. In the sixties Ham worked with Moro on a series of theatre design information sheets, which were published in the Architects’ Journal from which, in 1970, the ABTT commissioned Ham to compile and edit a book on theatre planning. This involved a further development of the Architects’ Journal fact sheets and the editing of articles by ABTT members with specialised knowledge and experience of theatre work. In 1972, the book Theatre Planning was published and in 1987, it was revised and expanded under the new title Theatres, Planning Guidance for Design and Adaptation. Tim Foster is the senior partner in Foster Wilson Architects (formerly Tim Foster Architects), an award winning practice specialising in buildings for the performing arts. Foster trained at the Cambridge University School of Architecture, where he also worked as a stage designer. Before establishing his practice in 1979, Foster worked for Roderick Ham & Partners and as a consultant architect to Theatre Projects Consultants, responsible for the design of several major performing arts projects worldwide. Upon Ham’s retirement, Foster took over the chair of the ABTT Theatre Planning Committee and in 2008 was asked to chair an Editorial Board to compile, and contribute to, a completely new theatre planning book. This latest edition, edited by Judith Strong, was published by the ABTT in 2010, in conjunction with Routledge, as Theatre Buildings: A Design Guide. Foster also co-curated the ABTT’s British Theatre Architecture entry to The Prague Quadrennial in 2011, The Guthrie Thrust Stage: A Living Legacy. He represents the UK on the OISTAT Architecture Commission and has been an organiser/jury member of the OISTAT Theatre Architecture competition in 2003, 2007 and 2011. He is a board member of London’s Tricycle Theatre Company and in 2009 was appointed by The Secretary of State as a trustee of The Theatres Trust, the National Advisory Public Body for Theatres in the UK. The list of ABTT Fellows now reads as follows: David Adams, Fred Bentham (deceased), Richard Brett, Tim Foster, Roger Fox, Roderick Ham, Chris Higgs, Ethel Langstreth (deceased), Iain Mackintosh, Maurice Marshall (deceased), Richard Pilbrow, Francis Reid, Peter Roberts, John Simpson and Ken Smalley (deceased).